Lately Lydia has become quite bored with her lunches. You can only eat so many salads. This has made me search for new ideas. This recipe is adapted from one found on Love and Zest. 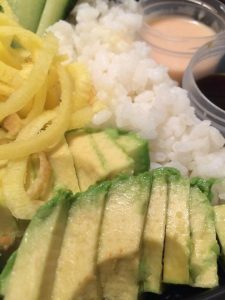 It has all the sushi flavors our family loves… rice, crunchy veggies, sea veggies, avocado and spicy dressing. Oh that spicy dressing!! I will make a batch of rice on Sunday and use it for 3-4 days for lunches, or use all of it for dinner for us. 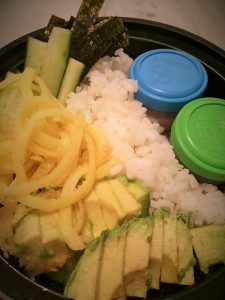 When using it for lunch, I prepare everything on Sunday (except the avocado) and keep it separated. Then put it together quickly each morning. 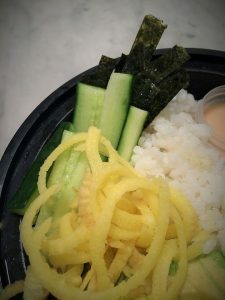 It is so easy, so tasty and so healthy. Rinse sushi rice and combined it with 1 1/4 cups water in a pot. (If using other rice, follow package instructions for making 2 1/2 cups cooked rice.) Bring to a boil. Reduce heat, cover with lid and simmer for approximately 15 minutes. Remove from heat and let stand covered for 10 minutes or until water is absorbed. (Again, please read your specific package instructions, and cook rice accordingly.) Remove cooked rice from heat and gently stir in vinegar and a pinch of salt. Allow rice to cool. In small bowl, whisk together the vegan mayo dressing, agave, Sriracha, and lime juice. Set aside. 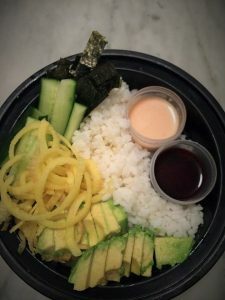 When ready to eat, arrange in 3 bowls approximately 3/4 cup of rice, seaweed, avocado, carrots, cucumber, any other veggies, and sprinkle with sesame seeds. 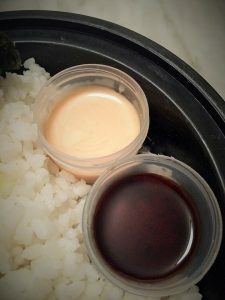 Serve it with the spicy dressing and soy sauce drizzled on top.